Pilgrims have now come back from the trip to the Holy places of Russian North, organised by our Cathedral from 31 of August till 5 of September. The group of 15 of our Parishioners has been led by our Parish Priest Fr. Vladimir. After coming to Moscow by air on 31st of September the pilgrimage started with Akafist to Mother of God served by Fr Vladimir inside the Chapel of Archangel Michel, inside airport building. 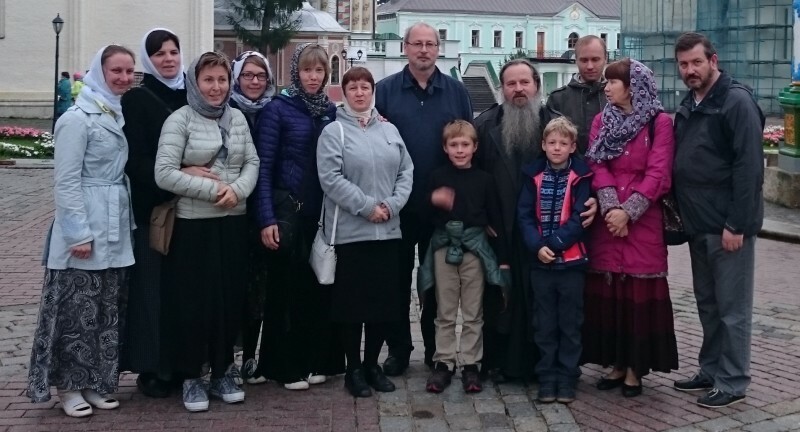 After Akafist, Fr Vladimir addressed the pilgrims, where he said that the pilgrimage is the time to live the life of prayer, fasting, attending church services in the monasteries we visit. Fr Vladimir also reminded to be strong in the face of physical tiredness and other difficulties often accompanying pilgrim’s life. After common Trapeza, pilgrims went to ancient town of Pereslavl by bus, which has been kindly leased to our group by father Igumen of Novospassky Monastery in Moscow. While on the bus journey, all pilgrims in turn have been reading aloud prayers from the Prayer book. This tradition has been in place daily throughout the whole pilgrimage. After arrival to Pereslavl, pilgrims stayed overnight in a small hotel in the historic part of the city. Next day started early with the morning prayers in the ancient Monastery of St Nikita, followed by the Devine. There we venerating holy relics of the monastery saints, as well other important sacred objects. One of these objects was the Heavy Burden Chains of St Nikita, The Stolpnik, after whom the monastery has been named. The chains were hanged in front of the icon of the Saint, so the people venerating the icon would go under the chains, and for the brief moment would bear the weight of them. These actual chains once belong to Saint Nikita himself, he was wearing for many years without ceasing, always standing upright inside a small confined space. After the Trapeza some of the pilgrims went to immerse themselves in the spring at the Holy Source of Sacred Water not very far from the monastery. The next destination for the pilgrims was the ancient church of Godenovo, which is home one of the most venerated objects of the Russian North – Holy, Wonderworking and Uncreated Crucifix of Our Lord, wooden cross dating from around 12 century. Fr Vladimir served in this ancient church the Akafist of The Holy and Life-giving Cross to our pilgrims. Many people and other pilgrims outside our group joined us in this service. Our next stop was the town of Great Rostov, and in particular St Jacob’s Monastery which has relics of the most venerated Russian Saints – St Dimitri of Rostov. After coming to pray before Holy relics of this saint and attending Akafist service in his name, we took off to Spaso-Prilutski Monastery, which would be the final destination for our pilgrims on that busy day. After arrival to Spaso-Prilutski monastery, our group has been warmly welcomed by the head of the monastery – Igumen Efimiy. Fr Igumen made a short guided tour of the monastery, talking about its history, reconstruction in post-Soviet time, showed us new Seminary located within the monastery, also shared with us his future plans for development… After the tour Igumen invited the group to Monks Trapeza space for the evening meal, which has been a great honour for our group, as the pilgrims would not be normally allowed in. Fr Igumen is the most interesting person, simple and very kind. Warm communications with our Pilgrims continued throughout Trapeza. After the meal Fr Efimiy invited all to the next day Morning Prayer service, which starts at 5 to 7am, followed by Devine Liturgy at 7 am. Fr Efimiy also gave the packet of monastery tea to every member of the group. On the 2nd of September most of the pilgrims came to Spaso-Prilutski ‘s Monastery main Cathedral at 5 am. After the services and Divine Liturgy followed by Trapeza, the group went to St Kirillo-Belosersky monastery – the true Jewel of Orthodoxy in the Northern Russia. One of the monks of the monastic brotherhood made a guided tour of the monastery and its outbuildings. There was a separate ancient chapel, built around the wooden Cross of St Kirill, who put up this cross at this location long before the monastery itself has been built, to indicate location, where he intended to build it. While on the monastery grounds, it has been rather unexpected for us to see many people in period costumes, including those in monastic robes. It took us some time to realise that there was a film production going on, apparently by some well-known Russian director. From St Kirill monastery we moved to our most Northern of the whole Pilgrimage, and arguably – most important one – to monastery of St Ferapont. There is a particular important spiritual link between St Ferapont monastery and our own parish in London. The fresques in our own Dormition Cathedral in Harward Road are currently being painted in the style of one of the greatest iconographers-saints of all times – St Dionysius. To see the original fresques made by this great iconographer, to feel the impression of these as seen from inside the ancient Dormition Cathedral of the St Ferapont Monastery – was a great event for the heart of every parishioner of our parish. On the way back from St Ferapont Monastery to Spaso-Prilutski Monastery, we stopped in a small village to see rare examples of ancient Orthodox wooden churches. Next day, 3 of September – services started at 5 am with monastic morning prayers, followed by Liturgy and Trapeza. Our next destination was Spaso-Kamennui Monastery (Saviour-on-the-rocks Monastery). We managed to organise this trip with the help of our friends from the St Trinity-Sergiev’s Lavra, as Spaso-Kamennui monastery located outside the usual pilgrimage paths. In fact it is located at the centre of a huge lake, and one can get there only by boat. It takes 90 minutes to get there by motor boat. There is a tradition for those pilgrims, who are reaching this monastery to bring with them some food for the monastery: some fresh bread, cereals, grain. In our trip to the monastery we were accompanied by some local people who knew the history of this Monastery, and current state of affairs of this wonderfully unusual place. Our small boat was slowly coming to the island, as we were surrounded by the beauty and tranquillity of the place. On the arrival to the island, our group has been warmly welcomed. We were offered most interesting and substantial lecture on the subject of monastery’s history and surrounding area, closely linked with the history of the Orthodox Church in the whole of Northern Russia. After the tour of the monastic building, bell tower and main Church, Fr. Vladimir served a short Panihida at the grave of one of the most venerated benefactor of the monastery, who lived inside the monastery for many years and gave it most of his life. On our departure, to say farewell to our pilgrims, the Igumen of the monastery himself, Fr Dionysius, came out to the mooring area to give us his blessing. After another boat trip back to the shore, pilgrims went Ancient Russian town of Yaroslavl. The group stopped for the night at the Pilgrims Quarters of Tolgievs Monastery, dedicated to entrance of Mother of God to the Temple. The next day, 4th of September, started with Divine Liturgy at the monastery’s main Cathedral. After Liturgy , followed by very tasty Monastic Trapeza in the Pilgrim’s Trapeza Hall, our pilgrims had opportunity to look at the outbuildings of this beautiful, well-kept women’s monastery, which seemed almost immersed in flowers, beautiful lakes with swans, gardens and orchards. From Tolgievs monastery pilgrims went to the ancient city of Rostov the Great. There we visited its Kremlin – its fortress with impressive walls, built around many important ancient Cathedrals inside it. After venerating relics of St Leontiy, we inspected reconstruction works in Dormition Cathedral. Despite the work still going on there, we were allowed inside and had unique opportunity to see the design of ancient iconostasis, as seen from location, not normally visible to the lay people. Using this opportunity, Fr Vladimir gave very interesting talk on the design of the iconostasis and the altar area in Orthodox Churches in general, answered many questions from our parishioners. One of the highlights of our visit to the Kremlin was the visit of the famous Rostov bell tower, which is the home of the best sounding heavy bells in the whole country, if not the whole Orthodox world. Our pilgrims had the opportunity of actually touching such world famous bells like Feast type day bell of St Jakob, Annunciation type bell Sysoi, Polielei type bell called The Swan and Fasting bell Golodar (‘The hungry bell’, as it is used only during Orthodox fasting periods). We concluded our visit of Rostov Kremlin by going to the Metropolitan Section of the Monastery, where many of us tasted various sorts of famous Rostov apples from the Metropolitan Apple Orchard. From Rostov, pilgrims went to the St Trinity-Sergiev’s Lavra – the final destination of our pilgrimage. After checking in to the Old Lavra hotel, which is located next to the monastery walls, pilgrims went to the Trinity Cathedral – the central and most sacred place in the whole of Lavra Monastery, which housing the relics of St Sergius. There we attended Akafist to the Mother of God, than the sermon, followed by Akafist to St Sergius. During Akafist to Sergius, there was opportunity to venerate relics of St Sergius, housed in the silver raka (coffin). While in Lavra, our group has been joined by Anna, the iconographer, who paints fresques in our Cathedral in Harvard Road, also we welcomed some our parishioners from London outside our pilgrimage group, who were there in Lavra at the same time almost by chance. Anna works in St Trinity- Sergius Lavra for many years and knows Lavra intricately. She gave us a short tour of the main Lavra places, and then kindly took us to the world famous Iconography School of the Lavra’s Spiritual Academy, where she works. That was exceptional opportunity, as normally the internal part Lavra is off limits to any visitors. We visited iconography workshops and saw icon painting process on various stages. Our pilgrims asked many questions regarding iconography techniques and Church cannons which guided iconographers in their work. As the Iconography School is actually located inside thick Lavra walls, student iconographers has opportunity to make fresques directly on the walls of academy, which has identical texture and features to the ancient Russian Orthodox churches, where these iconographers would work after graduation. This long day has been concluded with Trapeza and Fr Vladimir’s Pilgrimage summing up message, logistics for the last day. The last day, 5th of September, started early, and pilgrims had opportunity to have their confession in the famous in Russia confessional ‘Church Above The Gates’. After that they had a choice to attend one of the early Liturgies of Lavra, started at 6 -6.20 am. Many of our pilgrims chose to go to the Dormition Cathedral being the biggest Cathedral inside Lavra. After morning Trapeza, our bus took us to Moscow’s Domodedovo Airport. As the conclusion one has to say that our trip to the Orthodox Treasures of Northern Russia has been very intense, but the same time very useful for our souls. We visited many Holy Places, Monasteries, Churches, venerated relics of Saints and people who dedicated their live to the cause of the Russian Church, all of those who ‘Shone Their Light’ in the Northern Lands of Russia. We spend our time during pilgrimage in prayers, fasting, attending Church Services, were trying to attend early morning Monastic prayers despite lack of sleep. While on our short pilgrimage way, we met many wonderful, True Orthodox Christians, both Priests and lay people who have shown us by their own example how to Love the Lord, The Faith, Orthodox Church, how to live the life in prayer, and decent live the Orthodox Way. Glory be to God, Glory to Thee! Thanks to Thee, O Lord for all Your Deeds! 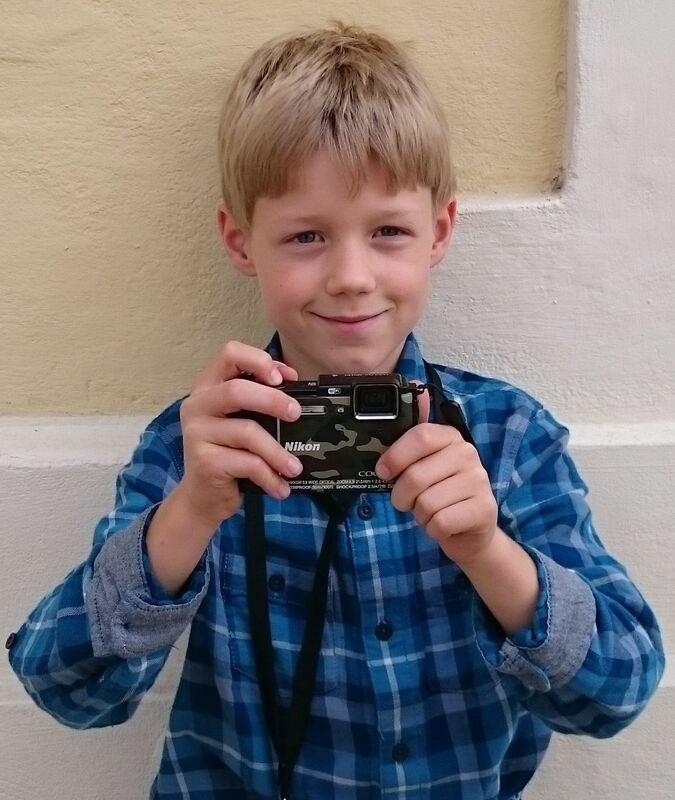 Photographs of the Pilgrimage are provided with the great thanks to our Russian Pilgrimage Chief Photographer – Gregory Vandromme.